If you are looking for a very early-ripening eating apple with excellent disease-resistance, Williams' Pride should be on your list. It is a medium-large apple, with a crisp flesh, and tart flavor. It is not unusual for the deep red color of the skin to bleed into the flesh, producing an attractive marbled appearance. Unusually for such an early variety, Williams' Pride can be stored (in a fridge) for several weeks. Fill in the details below and we will let you know when Williams' Pride apple trees are back in stock. Williams' Pride blooms slightly ahead of the main apple blossom season, but flowers over a long period, and is a good pollinator of many other apple varieties. The tree is a strong grower, eventually producing a spreading shape. Unlike many early varieties, which tend to drop their apples, Williams' Pride apples stay on the tree, and can be picked over an extended period of a week or so. 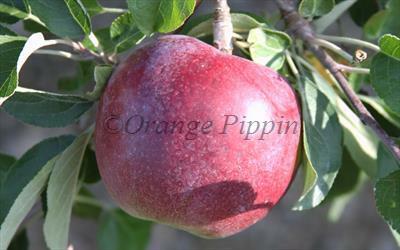 Williams' Pride has a wide climate range and is suitable for both cold and hot apple growing areas. Williams' Pride was developed by the well-respected "co-op" breeding program of Purdue, Rutgers, and Illinois (PRI) universities in the 1970s, and originally known as Co-op 23. It's ancestry is similar to that of many of the PRI varieties, including Rome Beauty and Malus floribunda, but it's early-season character probably comes from Mollie's Delicious and Julyred. It is named after Professor Edwin Williams of Purdue University, who led the disease-resistant apple research program at Purdue University. For this reason the correct spelling is Williams' Pride - not William's Pride.